PayPal Prepaid MasterCard is a reloadable debit card issued by The Bancorp Bank. The benefits of the card are that you can add money from your PayPal account instantly and open a 5% APY savings account. Plus, it has a reward program. 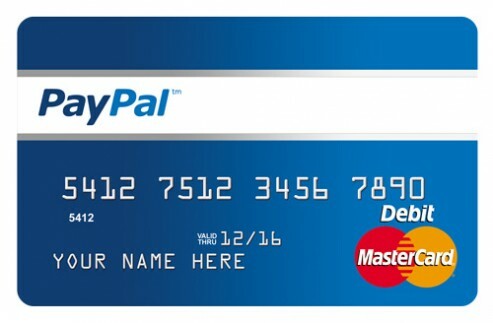 You can move money from your PayPal account to a prepaid card in no time. Limited $300 per day and $2000 per month. If you need to load more, use PayPal Basic Transfer or other methods. Please note that money has to be in PayPal account for a transfer. Money won’t move from backup funding sources such as credit cards or debit cards. 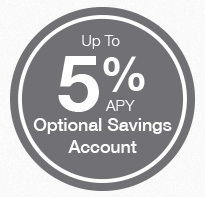 Any cardholder can open savings account that offer 5% APY. There is no minimum balance to open or maintain a savings account. They offer 5% APY on $5000 or less in the account. For the portion that exceeds $5000, they still offer 0.5% APY. You can take money out from savings account to prepaid account six times per month. Transferring from prepaid to savings is unlimited. 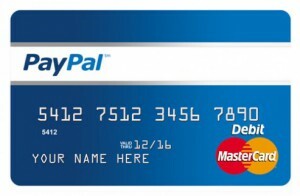 Here are all the ways to add money to PayPal Prepaid MasterCard. As I wrote this page, I don’t have any information about its Rewards Program. Before I applied the card, I learned at least there was a reward program, but there were no details in their website. I searched on the internet, but I couldn’t find the details, either. That is probably because most of writers of review sites don’t actually own the card, or they don’t use the card. Rewards are targeted offers. The issuer sends them based on your shopping habit. If you don’t use the card much, you don’t see any offers. I haven’t been using much, so there have been no offers so far. I will make some experiments and upload results on the other page. Here are the posts related to Rewards Program. PayPal Prepaid MasterCard has a savings account which offer 5% APY. You can open and maintain savings account with no minimum balance. Unlike Mango Money Card, you don’t need to enroll direct deposit to earn higher APY. Adding money from your PayPal or bank account is free. $4.95 monthly fee is non-avoidable. If you keep $1200 or more in a savings account, interest offsets monthly fee, and you can start saving. Apply through this link to get $5 sign-up bonus. 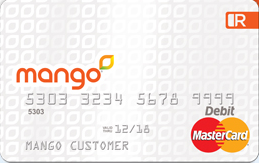 Mango Prepaid MasterCard is a reloadable prepaid debit card that has a MasterCard logo on it. 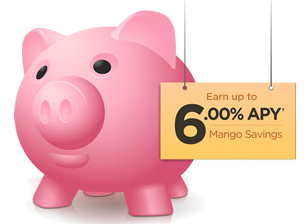 The great benefit of Mango is that you can open a savings account which offers up to 6% APY! All cardholders can open a savings account with as little as $1, and there is no monthly maintenance fee for a savings account. If you are enrolled in free direct deposit, you can earn 6% APY, otherwise 2%. These high rates apply only to $5000 or less in the account. An amount that exceeds $5000 is applied 0.1% APY. You can make six transfers from savings to prepaid account per month. Direct Deposit – Free. You can get $20 credit when you complete two direct deposits of totaling $50 or more within 90 days of opening your account. Enrolling a direct deposit is also necessary to earn 6% APY for Mango Savings account. If you visit some other review sites, you may see different information from the list above. That is because of the changes they made on June 15th, 2014. There are two major changes. One is that monthly subscription fee is reduced from $5 to $3, but there is no way to waive this fee. Monthly subscription fee used to be possible to waive if you load $500 per 30 day’s cycle. However, this option is gone. No matter how much you add or don’t even add any money, you are charged $3 every 30 days. The other one is that they don’t charge $10 for an account closure fee anymore. You can pay bills online such as phone, cable, and utility. There are no credit cards. However, since there is no need to load $500 every month (because of the rule changed for monthly subscription fee), all you need is enroll direct deposit (to earn 6% APY), and you can set up as little money as possible. So, there is no need to pay large bills anyway. Here is a list of categories in which you may find your billers. The best benefit of Mango Prepaid card is that you can open a 6% APY savings account. To earn 6% interest, you need to enroll a direct deposit. 6% APY applies on $5000 or less in the account. Any amount that exceeds $5000 is applied 0.1% APY. Since there is no option to waive monthly subscription fee, you don’t need to add money to the card much. Once savings reaches $5000, keep $5000 or less in savings account. An amount from direct deposit and interest of savings account should be unloaded and used for something better, such as depositing other savings account. ATM withdrawal charges $2. You can use BlueBird/Serve to unload Mango money for free. You can also make a small purchase and get cash back at registers. Let’s say, you always keep exact $5000 in a savings account, you will earn $300 annually. Considering $3 monthly subscription fee (which is not avoidable, $36 per year), an actual APY is 5.28%. It is still incredibly high rate! To apply for the card, click here to visit mangomoney.com.